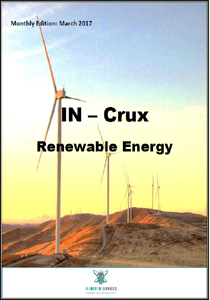 The report titled “IN- CRUX – Renewable Energy” is a monthly magazine, which provides complete overview of the renewable energy sector. It gives the monthly updates on recent development in renewable energy segment. In this edition, we cover “Scheme for Enhancement of capacity from 20,000 MW to 40,000 MW for “Development of Solar Parks and Ultra Mega Solar Power Projects”. The scheme aims to provide a huge impetus to solar energy generation by acting as a flagship demonstration facility to encourage project developers and investors, prompting additional projects of similar nature, triggering economies of scale for cost-reductions, technical improvements and achieving large scale reductions in GHG emissions. All the States and Union Territories are eligible for benefits under the scheme. States with good solar potential which have not yet submitted proposals would be encouraged for setting up of solar parks. The Nodal Agency of Ministry of New and Renewable Energy (MNRE), Government of India (GOI) would be Solar Energy Corporation of India (SECI). Who should purchase this “In- Crux”? Why You Should Buy this “In- Crux”?